Bobby Petrocelli’s (center) presentation was made possible in Marshall County because of the generosity of State Farm Agents (from left) Taylor Shepherd and Mike McCoy. One night, like any other, Bobby Petrocelli slept in his bed next to his loving wife in their suburban home. He was startled awake and found himself in his kitchen. A drunk driver had crashed through Bobby’s home, killing his wife and changing his life forever. Rather than choosing anger, Bobby chose to move forward, embrace forgiveness and created the “10 Seconds” organization. He now shares the You Matter message with audiences across the nation. With his background in teaching and coaching high school students, Bobby loves interacting with students and empowering them to make safe, positive choices. 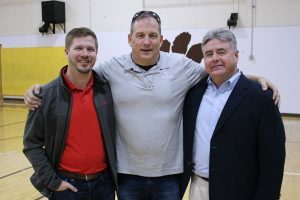 During presentations at Moundsville Middle School and John Marshall High School Friday morning, Bobby shared his story and encouraged students to build strong foundations for successful lives. Bobby revealed that hurt is the reason why people make bad decisions. He also explained how a bad experience and hurt can take over a person’s positive growth leading to a bad outcome. Thanks to a State Farm grant, Bobby was able to deliver his presentation to hundreds of Marshall County students. Bobby is a renowned speaker, educator, author and coach who has spoken at more than 5,000 schools and universities in all 50 states.